The State of Maryland is a major player in public schools funding. In FY17, the state will send $5.5 billion in operating aid to local school districts, about a third of its general fund budget. MCPS gets 28% of its operating budget from the state. Prince George’s County Public Schools gets 57% of its budget from the state. In total, state aid accounts for 48% of Maryland public school budgets. The state’s generous K-12 spending is driven by formulas dating back to 2002, when a state commission led by Howard University professor Alvin Thornton (commonly known as “the Thornton Commission”) proposed massive new investments in education. These investments have helped rank Maryland’s public schools among the nation’s best. Now another state commission chaired by former University of Maryland System Chancellor William E. Kirwan is reexamining the state’s funding formulas to see if they can be improved. And here is where things are starting to go badly wrong for MoCo. A consultant paid by the Maryland State Department of Education recently completed a two-year study on the state’s funding formulas. In the interest of promoting “adequacy” in public school spending for students across the state, the consultant made several recommendations for changing the funding formulas which are now being examined by the Kirwan Commission. One of them is that Montgomery County should get a 63% cut in state aid (a reduction of $354 million) while local taxpayers should pay 60% more (an increase of $842 million) towards MCPS. Montgomery County Council Member Craig Rice, a member of the commission, said “that would be devastating” and termed the suggested local dollar increase for MCPS “impossible.” Indeed, the County Council just levied a 9% increase in property taxes in part to increase funding for MCPS. The consultant’s recommendations don’t just apply to MoCo: they would phase out all state aid for schools in Kent, Talbot and Worcester Counties while sending massive increases to St. Mary’s, Harford, Charles, Calvert and Prince George’s. MoCo is already short-changed on state aid because of wealth formulas that disadvantage the county because of its high property values and high incomes but don’t recognize its high cost of living. The result is that MoCo taxpayers get back just 24 cents for every dollar in taxes they pay to the state. 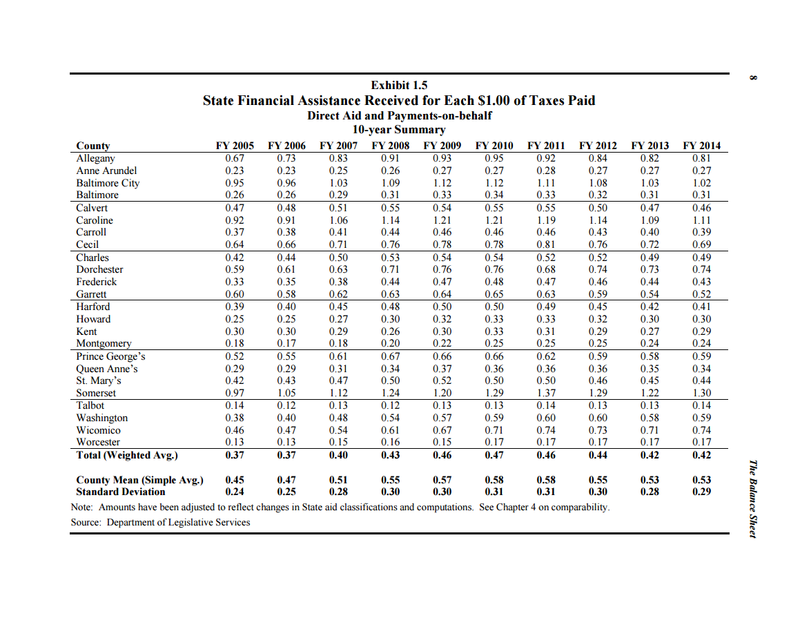 The state average for all residents is 42 cents. Howard County, which has a higher average household income than MoCo, gets 30 cents. Only Talbot and Worcester Counties get back proportionately less than MoCo. If anything resembling the consultant’s report winds up being recommended by the Kirwan Commission and passed into state law, this imbalance will get a lot worse. Your author has been told that the report is merely a “conversation starter” and thus is irrelevant. But we are reminded of the last conversation the state had about public school funding. For decades, the state covered the cost of teacher pensions as part of its commitment to K-12 education. The program was particularly valuable to MoCo, which has higher teacher compensation costs than other jurisdictions because of its high cost of living. A decade ago, state leaders began to have “conversations” about having the counties pay these costs despite the fact that Boards of Education, not county governments, set teacher compensation packages. A spokesperson for the Speaker of the House said it was “a philosophical argument that we definitely need to have.” In 2010, almost all MoCo state legislators promised to oppose a shift in their election campaigns. But just two years later, Governor Martin O’Malley proposed a partial pension funding shift, backed by both the Speaker and the Senate President, and most MoCo lawmakers voted to support it. The cost of the shift to the Montgomery County Government increased steadily from $27 million in FY 2013 to $59 million this year, with $6 million offset by the state. This far exceeds the cost to any other local government and is more than a third of the amount collected by the county’s recent 9% property tax hike. The county government now pays more for teacher pensions than it does for libraries, recreation, courts, IT, housing or environmental protection. Its teacher pension payments easily swamp any money earned from the liquor monopoly, which will return $21 million to the general fund this year. So goes these conversations. Now that this new conversation has started, here is a suggested response from all of our state legislators and county leaders to this consultant’s report.